After working closely with theatre group InterACT, OSA, the office for subversive architecture and the artist collective Zweintopf for a week, Exhibition Design Students could present first results of the Experimentation Labs in Graz. Ending a week full of workshops and creative progress, the three teams have accumulated ideas to improve the quality of stay in Jakomini Graz. On Friday, the 13th may people from around the city gathered to see the student’s presentations of long-term resolutions for Jakomini. The first group of students have worked with InterACT, an interactive theatre group targeted towards social changes in urban regions. Their week consisted of interviewing passers-by in Jakomini Street, Jakomini Square and Klosterwies Street. Most passers-by wanted more seating areas, more businesses or more green areas. On Thursday, the 12th InterACT theatrically performed these results for the public on Schönau Street. To create a friendlier environment with call to action in the borough, Exhibition Design students had the idea to replace the red road surface with green stripes on Jakomini Street. That would lead pedestrians to the right spots and create more interaction with shop owners and inhabitants. The second group of students collaborated with OSA, office for subversive architecture. While doing research throughout the semester students found out that Jakomini Street is a transitional area and is highly likely to continue being one. The aim was to make the transit more appealing. 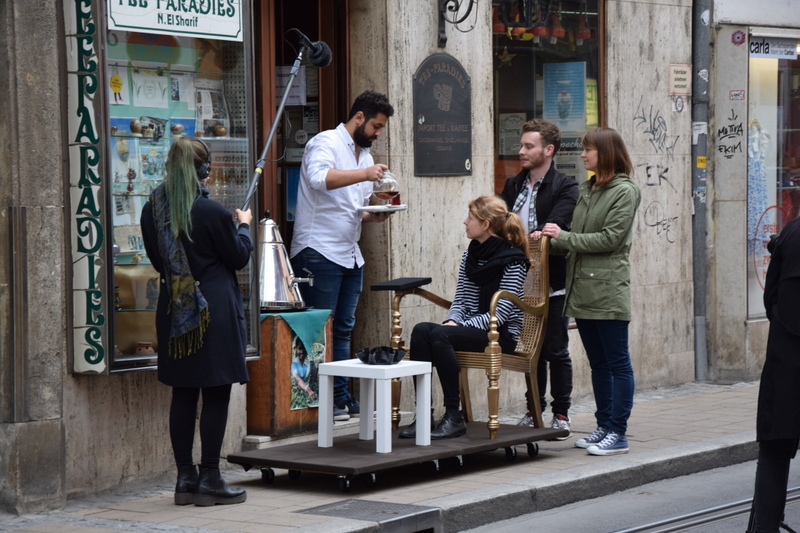 They experimented with a rolling chair in Jakomini Street creating an alternative way to use the sidewalk. Citizens could explore what the street had to offer, they have come up with “Three minute-service”. The concept was to offer a route through Jakomini Street, where citizens could sit on a comfortable chair on wheels while exploring the street. It takes three minutes to walk through Jakomini Street. By being pushed on a chair with on wheels those three minutes could be used more efficiently. To enforce the project, the students had the idea to work with local shop owners who would offer tea to drink on the ride. The third group of students worked with the artist collective Zweintopf. To create more awareness for the borough they had the idea to collaborate with the local radio station Helsinki. Their idea was to promote the borough with a radio programme called “The sound of Jakomini”. The idea is to have a programme for Jakomini inhabitants produced by Jakomini inhabitants. The student’s job was to record random outdoor noises from Jakomini’s streets, to create a sound that represent the borough. Ideally those sounds would be the jungle introducing “The sound of Jakomini”. Afterwards people who pass the streets could use sound boxes to stream the local radio programme live, while creating an open environment and a space to publicly enjoy Jakomini’s tones. The project had been well received by Radio Helsinki.